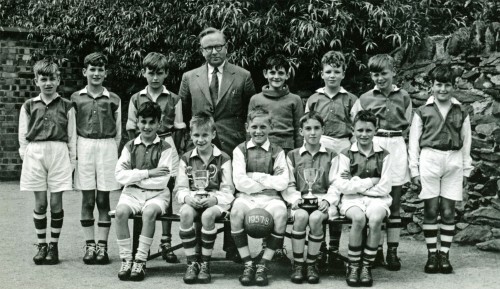 St Bartholomew’s Primary School under 11s football team, 1957-58 – Cup and league winners! Back row, left to right: Geoff Gamble, Tommy Allen, Paul Fortesque, Jack Briers (head), Malc Hopkins, Chris Allen, Rod Woodhouse, Derek Hood. Front row, left to right: Mick Holders, Derek Allen, Pete Edwards, Kenny Brown, Dave Pestall.